The Jack Russell is a sturdy, tough terrier, very much on its toes all the time. The body length must be in proportion to the height, and it should present a compact, balanced image, always being in solid, hard condition. The head should be well balanced and in proportion to the body. The skull should be flat, of moderate width at the ears, narrowing to the eyes. The stop, which is the transition area from backskull to muzzle, should be defined, but not over-pronounced. The length of the muzzle from the nose to the stop should be slightly shorter than the distance from the stop to the occiput. The nose should be black. The jaw should be powerful and well boned with strongly muscled cheeks. Eyes should be almond shaped, dark in color and full of life and intelligence. The small V-shaped, button ears are carried forward, close to the head and are of moderate thickness. It has strong teeth, with the upper ones slightly overlapping the lower. Two bites are acceptable; level and scissor, with scissor being preferred. The neck is clean and muscular, of good length, gradually widening at the shoulders. The shoulders should be sloping and well laid back, fine at points and clearly cut at the withers. Forelegs should be strong and straight boned with joints in correct alignment. Elbows hang perpendicular to the body and work free of the sides. The chest should be shallow, narrow and the front legs not too widely apart, giving an athletic, rather than heavily chested appearance. As a guide only, the chest should be small enough to be easily spanned behind the shoulders, by average sized hands, when the terrier is in a fit, working condition. 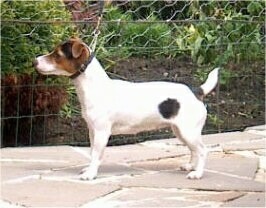 The back should be strong, straight and, in comparison to the height of the terrier, give a balanced image. The loin should be slightly arched. The hindquarters should be strong and muscular, well put together with good angulation and bend of stifle, giving plenty of drive and propulsion. Looking from behind, the hocks must be straight. The feet are round, hard padded, wide, of cat-like appearance, neither turning in nor out. The tail should be set rather high, carried gaily and in proportion to body length, usually about four inches long (when docked), providing a good hand-hold. Note: The practice of cutting off a dog's tail (docking) is illegal in some countries. The Jack's coat is smooth, without being so sparse as not to provide a certain amount of protection from the elements and undergrowth. Rough or broken coated, without being woolly. Colors: white should predominate (i.e., must be more than 51% white) with tan, black or brown markings. Brindle markings and black and tan coloring occur within the breed but are rare. Gait: movement should be free, lively, well-coordinated with straight action in front and behind. Old scars or injuries, the result of work or accident, should not be allowed to prejudice a terrier's chance in the show ring unless they interfere with its movement or with its utility for work or stud. 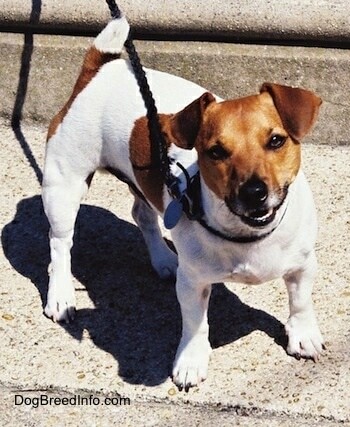 An Irish-type called Jack Russell Shortys has shorter legs than the English-type. The Jack Russell Terrier is a cheerful, merry, devoted and loving dog. It is spirited and obedient, yet absolutely fearless. Careful and amusing, he enjoys games and playing with toys. Stable Jacks are friendly and generally kind to children. Children should be taught not to tease or hit the dog. They are intelligent, and if you let them take an inch, they can become willful and determined to take a mile. It is paramount that you are this dog’s pack leader. He needs to be given rules to follow, and limitations as to what he is and is not allowed to do. Do not let this little dog fall into Small Dog Syndrome, where he believes he is pack leader to all humans. This is where varying degrees of behavior problems will arise, including, but not limited to guarding, snapping, separation anxiety, and obsessive barking. They are highly trainable and able to perform impressive tricks. They have been used on TV and in the movies. However, if you do not show authority toward the dog, it can be difficult to train. This breed needs a firm, experienced trainer. Jacks that have been allowed to take over can be aggressive with other dogs. Some have killed or been killed in dog fights. Be sure to socialize the Jack. It has strong hunting instincts (stronger than your average terrier) and should not be trusted with other small animals. This hunting dog likes to chase, explore, bark and dig. Only let it off lead if it is well trained or in a safe area. Will get restless and destructive if it does not receive enough exercise and activities to occupy its keen mind. Jack Russells climb, which means they can climb over a fence; they also jump. A Jack that stands 12 inches high can easily jump five feet. JRTs are not the breed for an inexperienced dog owner. The owner needs to be as strong-willed as the dog is, or this little guy will take over. With the right owner the Jack can really excel, but is not recommended for those who do not understand what it means to be a dog’s true pack leader. Jacks that are mentally stable, with all of their canine instincts met, will not display these negative behaviors. They are not traits of the Jack Russell, but rather human brought-on behaviors, which are a result of inefficient leadership, along with a lack of mental and physical stimulation. They will thrive with a job to do. 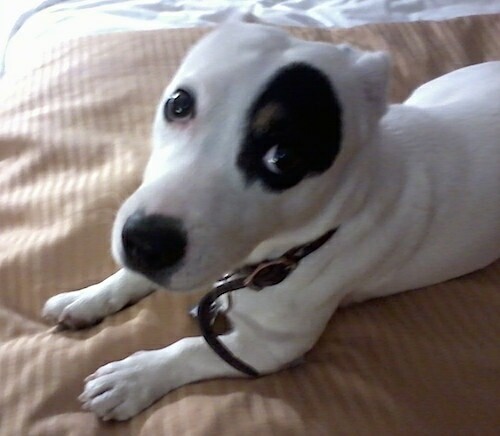 The Jack Russell Terrier must present a lively, active and alert appearance. It should impress with its fearless and happy disposition. It should be remembered that the Jack Russell is a working terrier and should retain these instincts. Nervousness, cowardice or over-aggressiveness should be discouraged and it should always appear confident. Some are prone to dislocation of the kneecaps, inherited eye diseases, deafness and Legg Perthes—a disease of the hip joints of small dog breeds. Prone to mast cell tumors. The Jack Russell Terrier will do okay in an apartment if it is sufficiently exercised. It is very active indoors and will do best with at least an average-sized yard. The Jack Russell Terrier is a pleasant companion when it is sufficiently exercised; however if it does not get enough, it may become a nuisance. It needs to be taken on a long, daily, brisk walk. In addition, he will be in his glory with space to run, hunt and play. If the Jack is left alone during the day, be it in an apartment or a house, it should be well exercised before the human leaves for work by taking it on a long pack walk or jog, and then taken out again when returning home. All coat types are easy to groom. Comb and brush regularly with a firm bristle brush, and bathe only when necessary. To show, owners must strip the coat. Like the rough coat, the broken coated Jack needs to be stripped out also. This breed is an average shedder. The breed was named after a clergyman named Rev. John Russell. It was used as a small game hunting dog particularly for red fox, digging the quarry out of its den in the mid-1800s. On English hunts, the dogs needed to be long-legged enough to keep up with the hounds. Breeders had emphasized its working ability, so the standard was very broad, allowing a wide range of accepted body types. Not happy with this wide variety of working type Jacks, as of April 1, 2003 the Jack Russell Terrier Association of America was changed to the Parson Russell Terrier Association of America. 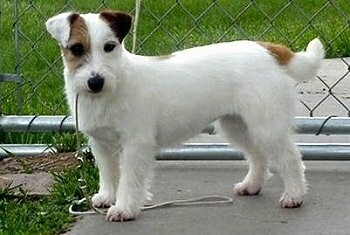 The working types remained Jack Russells while the American show types became known as the Parson Russell Terrier. 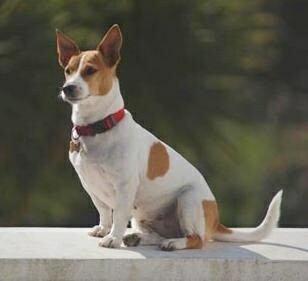 Some of the Jack Russell's talents include: hunting, tracking, agility and performing tricks. A Jack Russell Terrier named Moose played Eddie Crane on the television sitcom Frasier. FCI, ANKC, and IKC recognize the shorts as Jack Russell Terriers and the UKC recognize the shorts as Russell Terriers. The Parsons are the long-legged Jack Russell Terriers named officially Parson Russell Terriers. The Jack Russell Terrier and the Russell Terrier are the same breed, but are entirely a separate breed from the Parson Russell Terrier. The Irish Kennel Club has recognized the Jack Russell Terrier in Ireland, adopting the FCI standard for the breed. At one time the AKC recognized the Jack Russell Terrier, however as of April 1, 2003 they changed the name to Parson Russell Terrier. The breed split into two breeds and now the Jack Russell Terrier and Parson Russell Terrier are considered two different breeds. The Parson's name change is in great part to a lawsuit from the JRTCA to the AKC, when the breed was first allowed registration. In addition AKC, like the UKC, now recognizes what they call the Russell Terrier, which has shorter legs than the Parson Russell Terrier. 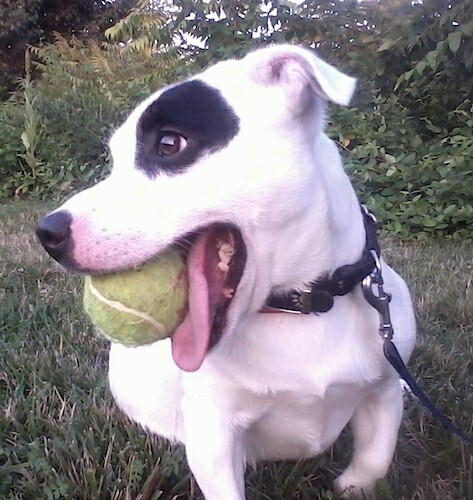 Spot the short legged JRT at 6 years old—"He is a very fun dog, loves to play 24/7 and loves his balls." 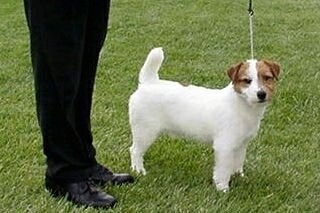 Belgian import registered with FCI as Jack Russell Terrier, UKC as Russell Terrier and IABCA in the U.S. as Jack Russell Terrier represents the short Jack Russell Terrier, 10" tall. This is Champion Elk Creek Gaffer who is number 2 in the U.S. for 2003, and he represents the recognized UKC breed Russell Terrier. 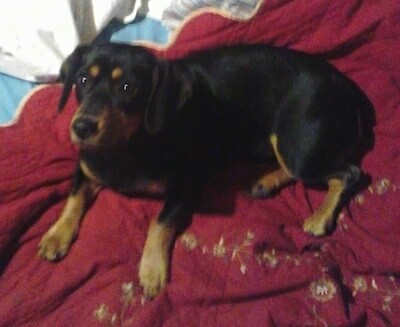 Dobie the black and tan Jack Russell Terrier at 10 months old—"Her name is Dobie, however we call her Dum-Dum, which is funny because she is very smart and loving. My partner bought her for my birthday this past March. When we went to get her we had a variety of pups to choose from. They were all the standard white with the different colored markings. She was the only one tan and black. The man said she was very rare. He also said he has only had one other pup colored like Dum-Dum. We wanted her because she is different. My partner and I love her very much and she is good with our children as well. Dum-Dum has her own blanket and pillow in the bed with us. She will not lie down or sleep if she doesn't have her blanket and pillow and she has to be next to my partner." 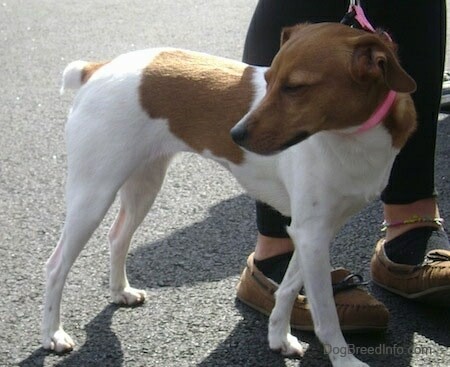 Sophie is an example of the shorter Irish-type Jack Russell as opposed to the leggier type.